If any of you are fans of America’s Next Top Model or are active on Instagram, you may have heard of Winnie Harlow. Isn’t she gorgeous? Winnie is one of the most famous celebrities with vitiligo. Her story of success, despite the judgement and pain she endured in her early life, is truly powerful. Winnie was diagnosed with vitiligo at age 4. In kindergarten, her friends ran away from her during recess because their parents instructed them to be wary of “catching vitiligo”. Despite assuring her peers and their parents that vitiligo is not contagious, they continued to ostracize her. Then the name-calling started. In middle school and high school, Winnie’s classmates compared her to animals, calling her names like “Dalmatian dog” and “zebra”. The bullying became so severe that she thought about killing herself and dropped out of high school. However, after posting pictures of herself on Instagram, an extremely famous model and reality TV show host named Tyra Banks scouted her for America’s Next Top Model (ANTM). Due to her unconventional appearance, Winnie received a lot of publicity from ANTM and soon developed a large fanbase, leading her to place 6th in the finals. Her success also paved the way for more young girls with skin conditions to join the modeling industry. A notable example is famous child model April Star (pictured below), who also experienced much bullying due to her vitiligo. Check out this video, which shows the moment that Winnie Harlow and April Star first met! It’s an extremely beautiful and emotional moment for both of them. I’m so happy that Winnie is changing the definition of beauty with her immense success. 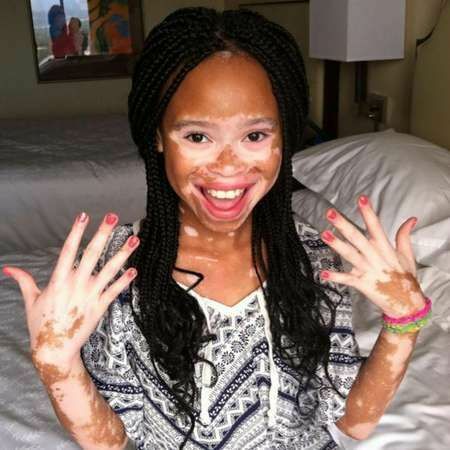 Her inspiring story has led countless vitiligo patients to view their multicolored skin in a new light and realize that they are truly beautiful.